The greatest rivalry in the NFL returns to Baltimore! To celebrate the battle between the AFC North’s Best, we’ve teamed with Vibrancy21 to bring you a tailgating experience second to none! 3.5 hour premium open bar, featuring the most prestigious and reputable brands available. Enjoy Tito’s Vodka, Bacardi Rum, Avion Tequila, Maker’s Mark, Jim Beam, Jameson Irish Whiskey, and much more! Over ten different beer selections! Drink Blue Moon, Heineken, Miller Lite, Tecate, Dos Equis, Natty Boh, Strong Bow Cider, Heineken Light, Red Stripe, Tecate Light, and more! A Delicious and extensive buffet hand-crafted by our very own Chef Tony, featured on Travel Channel and Food Network! Tony and his culinary team will customize a delicious menu paying homage to the best foods Pittsburgh & Baltimore have to offer! LIVE concert by Shoot To Thrill – an all-female AC/DC Cover Band! DJ Buddha spinning your favorite jams in between sets! Appearances by Ravens alumni! Take a photo with your gridiron heroes! Jimmy’s photo booth to capture your memories! We’ll also have a professional photographer and videographer on hand! Corn Hole, Kam Jam, Beer Pong, and a plethora of other games to keep you busy while you count down to kickoff! Our great sponsors will have vendor booths available for you to visit and check out their services! Free shirts, coozies, hats, and more will be given away throughout the course of the tailgate! Party only ONE BLOCK from M&T Bank Stadium at 1300 Russell Street, the future home of Hammerjacks! Our tailgates are visitor friendly, meaning we welcome Saints fans with open arms! Early admission for only $10 to enter 30 minutes early! Game ticket packages – both lower level and upper level tickets are available! 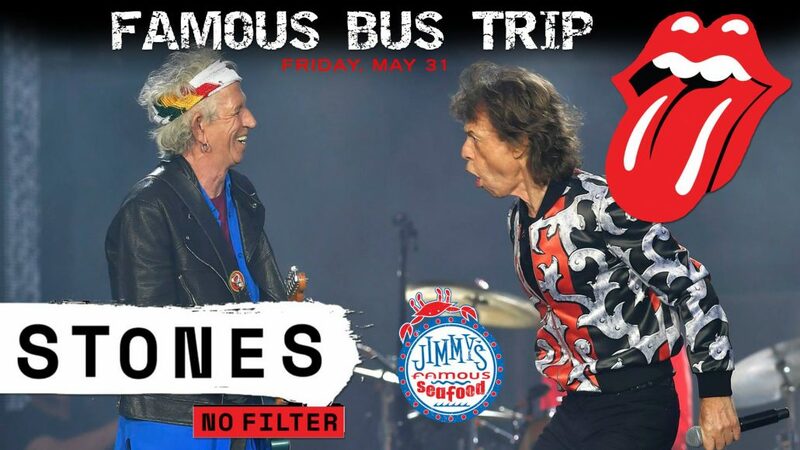 The Famous Motor Coach Option – this includes your transportation to and from the tailgate from Jimmy’s! We will bus you on our luxury bus, eliminating any parking concerns, and making sure you don’t drink and drive! Find out why ESPN, CBS, NFL Network, Barstool Sports, and many more national media outlets have covered this spectacle! Our tailgates sell out often, so don’t delay – #GetFamous today!